Enhanced Abilities: Darkseid’s strength, reflexes and endurance are all at super human levels. Invulnerability: Darkseid is almost invulnerable to physical and energy attacks. Omega Force: Darkseid possesses the Omega force, this allows him to project Omega beams from his eyes which disintegrate almost anything. Darkseid is able to resurrect any being destroyed by his Omega Beams. Darkseid can also use the beams to teleport people. 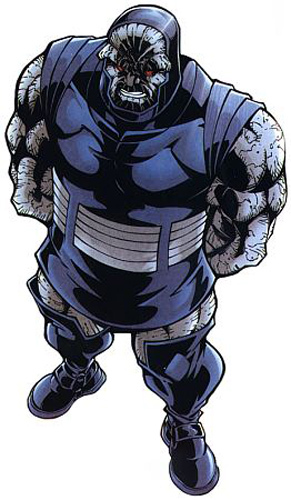 Healing Factor: Darkseid has a healing factor that allows him to regenerate physical damage. Time and Dimensional Travel: Darkseid appears to be able to travel both in time and through dimensions. Psionic Powers: Darksied has an array of psionic powers. Longevity: Darkseid’s absorption of the Omega force has made him immortal. Prince Uxas is the son of Queen Heggra of Apokolips, one of the two planets that are home to the race known as the New Gods. He planned to gain the throne at any cost. Second in line to the throne behind his brother Drax, Uxas created political upheaval while his brother attempted to make peace with the nearby world of New Genesis. When Drax attempted to claim the fabled Omega Force and assume godhood, Uxas murdered him and claimed the power for himself. Renaming himself Darkseid after the apocryphal god, Uxas assumed the throne and began a war with New Genesis.